During the last quarter, the company added $4.1 billion in cash to reach a total of $45.839 billion or $49.43 per fully diluted share. This is divided into three types of holdings (long- and short-term marketable securities and cash equivalents). To illustrate, the following chart shows the total cash equivalents for the company. The orange colored bars represent long-term securities. If they are excluded, an investor may conclude that Apple’s cash has been *declining* since 2008 when the opposite is true. The company is shifting an increasingly larger proportion of its holdings to long-term (but fully liquid) securities. 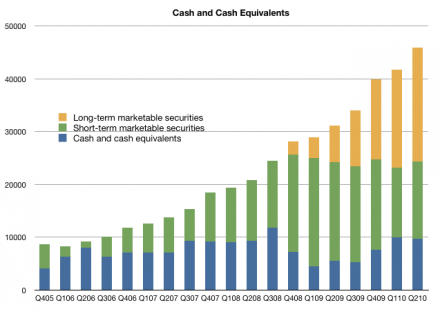 The company devotes 9 pages in its 10-Q to describe and value the cash positions it holds. It’s a pity that most aggregators of the company data don’t bother to note $21 billion in assets.